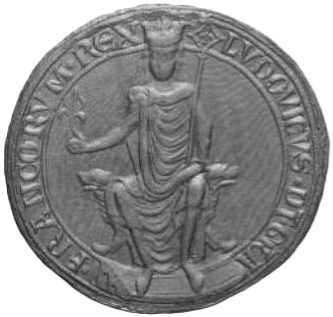 Louis was King of France from 1223 to 1226, and also claimed to be King of England from 1216 to 1217. He was the only surviving son of King Philip II of France by his first wife, Isabelle of Hainaut, from whom he inherited the County of Artois. During the First Barons' War of 1215–17 against King John of England, his military prowess earned him the epithet the Lion. After his victory at the Battle of Roche-au-Moine in 1214, he invaded southern England and was proclaimed "King of England" by rebellious barons in London on the 2 June 1216. He was never crowned, however, and renounced his claim after being excommunicated and repelled. He died in 1226 and was succeeded by his son Louis IX.